County Executive Edward Mangano and his wife Linda attended with their two Dachshunds Max and Rocky. East Meadow, NY - October 27, 2013 - Nassau County Executive Edward P. Mangano announced today that his first annual Nassau Barkfest which was held earlier today at the County’s Eisenhower dog park was a tremendous success with over 500 pets participating in the parade and pet contest and 700 dogs visiting the dog park. The free event was sponsored by Pet Supplies Plus Long Island, Long Island’s K98.3, Anton Community Newspapers/Long Island Weekly and Naudus Communications/South Shore Tribune. In addition to the costume contest and parade many rescue groups and animal friendly organizations were on site to celebrate. 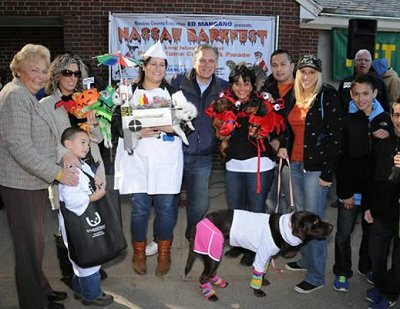 Subject: LongIsland.com - Your Name sent you Article details of "Mangano: Nassau's First Annual Barkfest A Success"